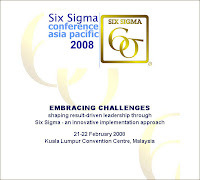 engagement at the annual Asia Pacific Six Sigma Conference that was held at Kuala Lumpur, Malaysia on 21st and 22nd this year (2008). As mentioned in that post, I was honoured to be invited to participate, and was able to offer 'best in class' case studies where we have applied 'Lean Thinking' and DSS methodologies in business (non-manufacturing) processes. DSS and Lean are very powerful for any organization in today's business environment, and by utilizing the appropriate tools we are achieving millions of dollars of savings across our organization and businesses. I have just now received a video from the event, which I have posted to YouTube. I was hoping to get the 30-minute presentation I gave, in it's entirety, but all I have received to date, is a 'snippet' of the overall conference (which is still very interesting when you see the 'high flyers' in attendance and presenting). Remember to pause the streaming music (O Singapura) on the left of my blog screen before playing the video, so as to get the full enjoyment of the Video Stream and background music. Included in the audience at the February conference were a selection of Malaysian dignitories and Government officials. As a result, I have been asked to speak at the Malaysian Government's "Annual Supply Chain & Procurement Conference" to be held also in Kuala Lumpur on July 15th and 16th. I have graciously accepted. The following is an extract from my original article, and includes the official Motorola press announcement after the event. Following below this, are various links relating to the conference, including the official content brochure and presentation materials of the speakers. KUALA LUMPUR, MALAYSIA, 21 February 2008 – Motorola, Inc. (NYSE: MOT) today announced that more than 400 delegates comprising senior Motorola leaders and customers gathered to share industries' practices and experiences at the inaugural Motorola Six Sigma Conference Asia Pacific 2008. Organized by Motorola University Asia Pacific, the two-day conference took place at Kuala Lumpur Convention Centre and was officiated by the honorary Datuk Seri Dr. Jamaludin Jarjis, Minister of Science, Innovation and Technology. Focusing mainly on existing and potential Motorola customers, this exclusive event provided a conducive learning experience and interactive platform for Six Sigma practitioners to present their views and successes in implementing the world-renowned business process improvements and defect-reducing methodologies. The conference focused on four key areas: Six Sigma Strategy and Leadership Alignment, Innovation through Design for Six Sigma, Leading Six Sigma with Lean Thinking and Six Sigma Achievement in Services. The uniqueness of this conference was the sharing of the showcases by the actual practitioners from various organizations. Delegates benefited in discovering how to enhance their respective businesses by learning to align their business strategies and goals, incorporate new methodologies into their innovations and applying Lean Six Sigma principles. In addition, the conference helped delegates to better understand customer expectations and requirements by employing the Six Sigma concepts and tools that offer the most impact to the services industry. One such session showed delegates how the application of Design for Six Sigma concept, using the DMADV (Define, Measure, Analyse, Design, Verify) methodology, can help to build good leadership strategies that focused on a strong innovation culture, leading to long-term growth and sustainability. The DMADV methodology is not commonly known or practiced in the industry, but it encourages breakthrough innovation which is an effective way to create a new product or a new process design. Leading Six Sigma with Lean Thinking is a great example of how delegates can apply Motorola University’s Lean Six Sigma principles and tools in conjunction with the Six Sigma rigor and methodology to achieve rapid and significant improvements with greater speed and reduced process variation and wastage. Delegates also learnt how to play their roles and effectively manage, support and motivate their teams, and apply project management skills to achieve desired goals. In addition, delegates learnt how Six Sigma can be successfully applied to the service industries. A host of 18 speakers from six countries - Malaysia, Singapore, India, China, Taiwan and USA led the sessions, which comprised 12 case studies by organizations spanning practices from six industries: electronics, telecommunications, information technology, banking, manufacturing and plantation. Kamaldin stated that although Six Sigma was originally designed to reduce defects in manufacturing processes, the methodologies have evolved over time and have proven to be applicable and effective beyond manufacturing industries. “In order to improve service quality, focus on service processes is necessary. Six Sigma is a philosophy which concentrates on the improvement of process and if properly applied is highly applicable to a wider range of services. The wider applicability of Six Sigma depends on the identification of key performance indicators (KPIs) for different types of service processes,” he said. “The presence of some of our customers from the services sector, including that of Call Center and IT industries further testify to the evolution of Six Sigma; how it has transformed from a process-defect reduction exercise into a strategic management programme across multiple industry practices,” he added. Conceptualized in 1986, the programme has since been adopted by thousands of companies worldwide. Six Sigma projects boast a Return on Investment (ROI) ratio between 1:10 and 1:50 and have resulted in a total savings of about USD$17 billion for Motorola Inc. Created by Motorola, Six Sigma is one of the world’s leading business process improvement initiative, offering tools and techniques to improve efficiency, maximizing human capital, and empowering leadership through its Six Sigma Black and Green Belt programs. Motorola is a globally recognized leader in corporate education and is the creator of Six Sigma. As the learning arm of Motorola, it supports the company’s continued development and breakthroughs in marketing, supply chain management and engineering by training people and optimizing quality. The university offers a compelling spectrum of professional training and education programs in different areas of management. Visit http://www.motorola.com/motorolauniversity.jsp to learn more about Six Sigma and Motorola University. With over 30 years of corporate presence, Motorola Malaysia has established itself as a leading manufacturer of high technology wireless communications solutions and accessories for the global market. Motorola Malaysia's operations consist of a world-class Integrated Manufacturing, R&D and Distribution Center, a Multimedia Super Corridor (MSC)-status Motorola Malaysia Software Center Group and a corporate and sales office. Motorola is known around the world for innovation in communications. The company develops technologies, products and services that make mobile experiences possible. Our portfolio includes communications infrastructure, enterprise mobility solutions, digital set-tops, cable modems, mobile devices and Bluetooth accessories. Motorola is committed to delivering next generation communication solutions to people, businesses and governments. A Fortune 100 company with global presence and impact, Motorola had sales of US $36.6 billion in 2007. For more information about our company, our people and our innovations, please visit http://www.motorola.com/.